The Orchard Manhattan is an original twist on the classic manhattan cocktail, though I’d say it’s closer to an old-fashioned, actually. It’s made with bourbon, apricot and walnut liqueurs, and black walnut and autumn-spiced bitters. I can’t tell you what the autumn spices are, but I can tell you that I like this drink right from the presentation. The cherry garnish divides it into visually pleasing segments. 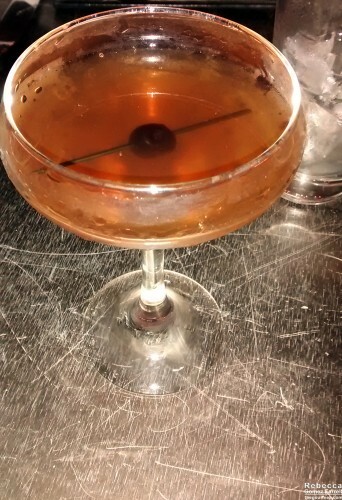 The drink maintains the dryness of a manhattan, although it is sweeter than the standard. The walnut presence makes me think of praline candies, and I enjoy the floral note that probably rides in with the apricot liqueur. However, I miss the little hint of citrus that comes with an orange twist or wheel in an old-fashioned. Somehow, the apricot liqueur doesn’t capture it. Add the citrus back in, and this drink is near perfection.